This suite of graphics was commissioned by KPCC for its Summer membership drive in 1995. These graphics are for the front and back of T-shirts. 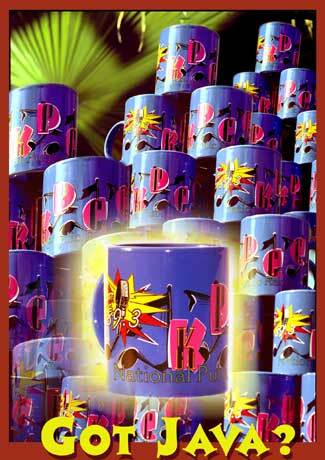 I also designed the coffee mugs below. In addition to designing merchandise I began to create a suite of icons and graphics for each of the station's major areas of programming--a country and roots music show; a jazz show, and so on. Only the "Monday Night" icon was completed, because the station changed its format and programming soon after the fundraiser.